Microsoft Enterprise Mobility Suite, also known as Microsoft EMS, is a group of Microsoft products that help enterprises securely manage devices and user identity. Microsoft EMS brings application access management, device management, and security management under a single roof. The cloud-hosted service can be integrated with on-premise infrastructure. The suite, which includes identity and access management, mobile device and app management, and information protection, supports an organization’s move to a cloud platform for business applications and ensures that the devices and users accessing those applications can do so easily and securely. It supports the changing business environment that requires an organization to secure personal and corporate devices, allows single sign-on for cloud and on-premises applications, and gives organizations the ability to provision and deprovision users rapidly, in support of business growth and flexibility. In 2015, “Microsoft commissioned Forrester Consulting to conduct a Total Economic Impact™ (TEI) study and examine the potential return on investment (ROI) enterprises may realize by deploying the Enterprise Mobility Suite (EMS)”. According to the Forrester report, Microsoft Enterprise Mobility Suite increased productivity by providing users access to applications 25% faster and also reduced security-related expenses. EMS offers a bundle of services that includes Identity and Access Management, Managed Mobile Productivity, Information Protection, and Identity-driven security. 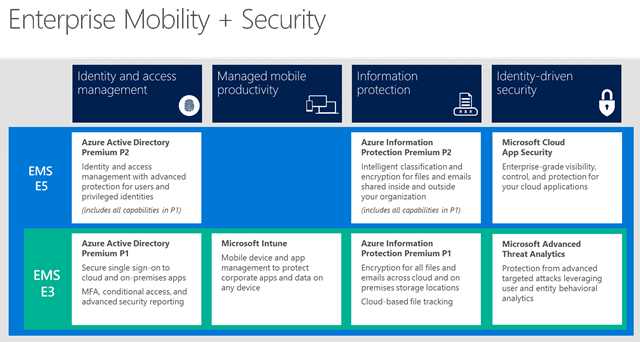 Microsoft Enterprise Mobility + Security has seven components as listed below. option to track, classify and label data. integration with Office 365 helps keep company data secure in the Office mobile apps. Microsoft Cloud App Security – provides deep visibility and control of data inside cloud applications. Microsoft Identity Manager – Synchronise identities between directories, databases, and apps. Administer self-service password, group and certificate management. Increase admin security with policies, privileged access, and roles. Azure Advanced Threat Protection – Detect and investigate advanced attacks on-premises and in the cloud. Microsoft Enterprise Mobility + Security (EMS) is the only comprehensive solution designed to help manage and protect users, devices, apps, and data in a mobile-first, cloud-first world. Microsoft also offers a 90 day free trial for customers who want to experience Enterprise Mobility + Security suite. Microsoft also offers FastTrack, a managed support service to help customers deploy EMS quickly. Under the program, which is already included in the Enterprise Mobility + Security subscription, Microsoft experts help EMS customers “define their mobility and security vision, and to create a deployment plan”, onboarding and remote assistance.